WASHINGTON — To deal with the nearly $900 million budget hit NASA will absorb if automatic spending cuts known as sequestration are allowed to take effect March 1, the U.S. space agency would slow development work on commercially operated astronaut taxis, delay or cancel space technology programs and postpone the launch of some small science missions. NASA Administrator Charles Bolden outlined the space agency’s sequestration plans in a Feb. 5 letter to Senate Appropriations Committee Chairwoman Barbara Mikulski (D-Md. ), who released it following a Feb. 14 hearing. NASA’s overall budget would drop to $16.9 billion, down from the $17.8 billion Congress approved last year. NASA, like all federal agencies, has had its funding frozen at 2012 levels under a stopgap spending measure known as a continuing resolution that expires March 28. NASA’s sequestration plan assumes that the continuing resolution will be extended through Sept. 30, the end of the U.S. government’s 2013 fiscal year. Bolden said NASA’s commercial crew partners would feel a funding pinch as soon as July. A July test of Boeing’s CST-100 orbital maneuvering and attitude control engine. A September review of an in-flight abort test SpaceX plans to conduct in April 2014. An October integrated system and safety analysis review of Sierra Nevada’s DreamChaser space plane. "Overall availability of commercial crew transportation services would be significantly delayed, thereby extending our reliance on foreign providers for crew transportation to the International Space Station," Bolden wrote. Meanwhile, a sequester would also put the screws to NASA’s Space Technology Program, a White House priority under U.S. President Barack Obama. Instead of getting the $699 million sought for the program, NASA would cut its budget back to $550 million, or about $24 million less than it has now. 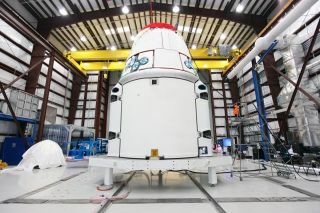 To absorb the cut, NASA would consider canceling programs now in the development stage, including a highly publicized demonstration of a deep-space atomic clock, which was set to fly as a hosted payload on an Iridium Next satellite scheduled for launch in 2015. Four other space technology programs could also wind up on the chopping block, Bolden warned, and nine others might be delayed. Small astrophysics and Earth science missions would also suffer under NASA’s plan to reduce the Science Mission Directorate’s budget to $4.86 billion. While that is only $51.1 million less than Science would have received under the agency's 2013 budget request, it is $200 million less than the mission directorate has today. The next missions scheduled for launch in NASA’s Explorer line of small astrophysics missions are the Interface Region Imaging Spectrograph, an ultraviolet observatory slated for an April launch, and Astro-H, an X-ray observatory scheduled to launch in February 2014. The next Earth Venture launch on NASA’s calendar is the Orbiting Carbon Observatory-2, which is supposed to lift off in July 2014.